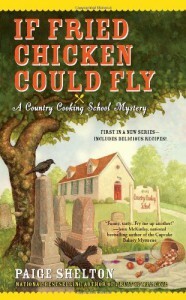 If Fried Chicken Could Fly - Paige Shelton - review - What is Kimberly reading now? I guess I'm the only one that didn't know about the ghosts. I picked this book because I like the author's Farm Fresh series and I was pleasantly surprised by it. I'm going to have to read another book in the series to see if I warm up to Betts. The reason behind the murder was interesting. The fact that it tied into why the ghost was there in the first place helped to justify the ghost being there in the first place. A lot of clues found were with the help of the ghost and I don't think the clues would have been found had he not been there. I guess more ghosts show up in the rest of the series, but I how this ghost comes back later. Now that I've said 'ghosts' 6 times, let's make it an even 10: ghosts, ghosts, ghosts and ghosts.